The small rocky island of Dokdo in the East Sea is in the news again owing to a public relations effort by the Japanese government to claim that it is actually Japanese territory. Late last year, Japan's foreign ministry posted a video to YouTube in several languages making such a claim. Readers of this blog will know that I've posted frequently on this topic in recent years (if you're interested, just enter the word Dokdo in the search box at the right.) Dokdo illustrates one of the main issues of the emerging information era in which cyberspace contains a flood of information, making it more difficult to sift out the truth and trustworthy information from rumors and falsehoods. South Korea's Ministry of Foreign Affairs has put up a new section on its website, which is so far only available in Korean. The accompanying graphic is a partial screen capture from that site. 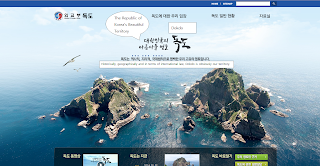 (click to see a full size version) The Ministry has also published a short video to YouTube that explains why, historically, geographically and in terms of international law, Dokdo is Korean territory. What makes this matter so hurtful and even insulting to many Koreans is that a large part of the "evidence" Japan has assembled to support its claim to Dokdo involves events after 1905, and the start of Japan's near half-century colonization of South Korea.